3.0 out of 5 starsWell written novel but you have to love angst and suspend believe at time! The book was well written and the concept "from best friends to lovers" approached in a different way than others in this genre. As many other reviewers have commented on, the book is full of angst. I do not mind a bit of angst but for me there was just too much unnecessary angst. The story felt too contrived at times and at times it became unbelievable. (Spoiler alert) It was never well explained why B did not return to San Diego and Jaime after her father died. Had difficulty seeing a link between the problems she had with her father and her love for Jaime. Further Jaime having B wait for 2 years without any contact before returning to her (after declaring his love and telling her he wanted to be with her) even with his divorce problems seems quite unbelievable, any sane person would have tried to contact B somehow (through her friend Jenna e.g.). Also B just sitting at home and waiting desperately for 6 months for Jaime to contact her and then trying to forget him seems unbelievable. Once again any sane person would have flown to Fort Lauder-dale and demand an explanation. The unnecessary angst around these events just irritated me and took away some of the enjoyment of reading this well written novel. I've had this on my kindle for awhile. I started reading it but at the time couldn't get into it. However I thought I'd give it another go. It does start out a bit NA so that's initially what put me off. However it does lead the character to their 30's, so as you can imagine there is a lot of angst. The type where you don't know who to strangle first. B & Jamie just connected but the timing was never right. So also bear in mind there is some cheating. There was distance, family issues, death, schooling & many things that kept them apart. But when B finally came to her senses it was too late. Of course there were reasons for everything. But you'll have to read it to see if the train wreck is repaired. 5.0 out of 5 starsAmazing, heart breaking and unforgettable! Thank God it's over, I've never been so stressed with a book, anger, palpitations and tears. How can two people who love each other hurt each other so much?! I didnt get it! 10 stars for Kandi Steiner's writing, whom I've loved since reading Black Number Four! 3 stars for this angsty, complicated love story. This books puts the reader through the ringer. Unrequited love, cheating, love, lust, anger, pain, selfishness, revenge ugh! B had such a twisted view of love and relationships and who could blame her,and then the first guy she falls in love with doesn't notice and falls for her best friend! WTH?! Hell to the No. Somehow I just couldn't forgive or like Jamie. That initial meeting turned me off him. His blonde fetish and manwhoring through college. Really wished we could have had a chapter or two from his POV! If you love angst "Thoughtless" style, you will love this brilliantly written book! I have a serious book hangover after reading this. What a beatifully written story. I laughed, i cried, i hated and i loved. Kandi Steiner really knows how to draw you into the story. I have never 'felt' as much as i did whilst reading this. So much happiness and sadness. Anxiety and relief. My first book from Kandi Steiner and what an excruciating read it was! But I loved every heartbreaking word. The push and pull of these two characters was so painful to read and the wrong timing, so frustrating! Whenever I thought yes this time it will be their time something happen to pull them apart, either something, someone or their own stubbornness. The writing was addictive and oh so smooth loved it! The ending was beautiful, heartwarming and just what I craved for these two lifetime lovers. I don't really know if I loved it or hated it but I know I couldn't put down until the last page where I think I threw my kindle against the wall and said "well F YOU!"" 5.0 out of 5 starsDo Yourself A Favour! This book was so addictive I read it over 2 days. 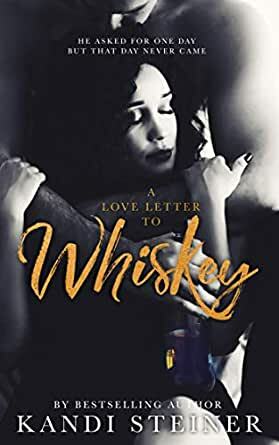 I loved the way the author drew me in with her addiction to whiskey. Gut wrenching book with some many highs and lows. Absolutely loved it.